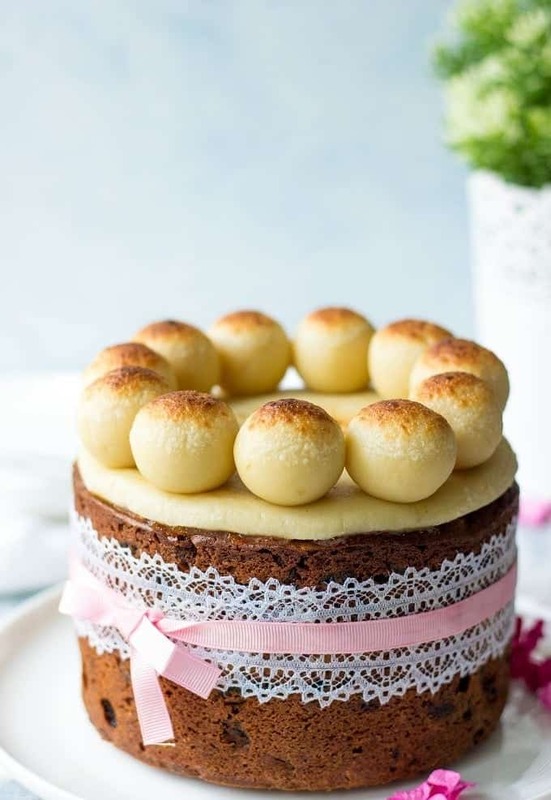 Surprisingly easy to make, loaded with dried fruits and almond paste, this absolutely mouthwatering Simnel Cake will become a beautiful addition to your Easter table. This is a decadent treat for any occasion! Friends, I never stop to be amazed by how beautiful and festive European holiday desserts are. Just a few months ago I shared with you this incredible Danish Rice Pudding and German Christmas cake. And now, it’s almost time for Easter festivities. Last year, I showed you how to make a traditional Russian and Ukrainian Easter Bread. It’s a family’s favorite recipe that never fails. Few days before Easter Sunday, expect to see me in the kitchen covered in flour and baking Paska. If you haven’t tried Paska yet, I included a step-by-step photo instructions to help you make the baking of Paska a little bit easier. I forgot to tell you, but my parents are here now and my mom helps me a lot in the kitchen. She also supplies with me all kinds of cooking ideas for my blog. She was the one, who showed me a beautiful Simnel Cake. Despite that the cake looks quite fancy, you’ve got to believe me, it’s not that difficult to make. In fact, I was anticipating spending half a day in the kitchen. But surprisingly, I finished the whole thing much sooner than I expected. And in the evening, when my mother-in-law stopped by and joined us and my parents for dinner, we all could enjoy a good slice of this super moist and yummy Easter Cake. Did I say Easter? In United Kingdom, Ireland and several other countries, Simnel Cake is considered a traditional Easter Treat. Its signature ingredients – dried fruits (lots of them!) and marzipan. These ingredients by default will make any recipe delicious. But let me tell you, since I made the cake long before Easter, I’m pretty sure I’ll be making it even after Easter. It is that good! The cake batter somewhat reminds me of the Easy Fruit Cake Recipe that I made recently. It’s full of delicious and juicy dried fruits. You can use any combinations of dried fruits you like. I used raising, cherries, papaya and pineapple. Currants would be a great addition too. 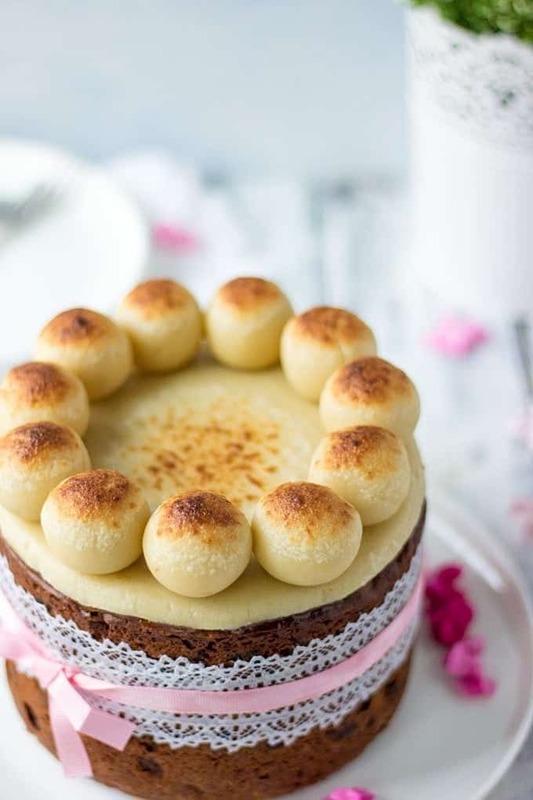 Simnel Cake serves 11 people and perfect for Easter Sunday brunch to feed a crowd. Try it for yourself and let me know what you think. Preheat the oven to 275 F and line 6" round deep cake pan with parchment paper. In a medium bowl add raisins and whiskey and leave for 30 minutes. In a large bowl, combine candied papaya and pineapple, raisins, almonds, orange zest, sugar, almond meal, melted butter and eggs. Mix well. In a separate medium bowl, whisk together flour, baking powder, nutmeg, ginger and cinnamon. Slowly add flour and spice mixture into the dried fruit batter and mix just until all ingredients are combined. Spoon half of the batter into a cake pan. Place ⅓ of almond paste in between 2 sheets of parchment paper and roll it out into 6" round disk. Repeat with another ⅓ of almond paste. Place one almond paste disk on top of the batter. Spoon the remaining batter into the pan and bake for 3½ - 4 hours until toothpick comes out clean. (See the notes). Remove from the oven, leave it to cool. Remove cake from the cake pan. Spread a thin layer of apricot jam on top of the cake and place the second almond paste disk on top. Form 11 even size balls from the remaining almond paste and arrange them on top. Place cake under the broiler for 1-2 minutes until top of the cake is slightly toasted. *If cake starts to brown too fast, cover it with a foil. Simnel Cake easy to prepare. Its crumbly and delicious desert for the whole family. I replaced cherries with dried cranberries. And with baking spices, the aroma are very elegant. 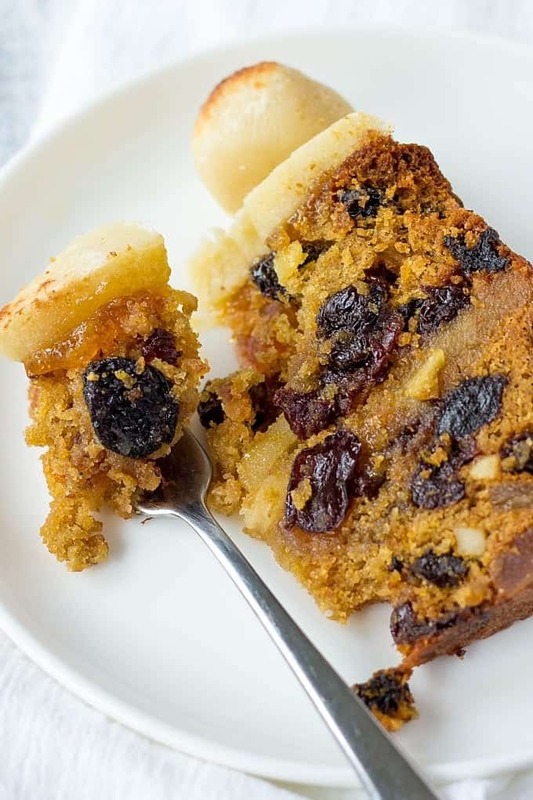 If you want to surprise your guests-bake Fruit cake. 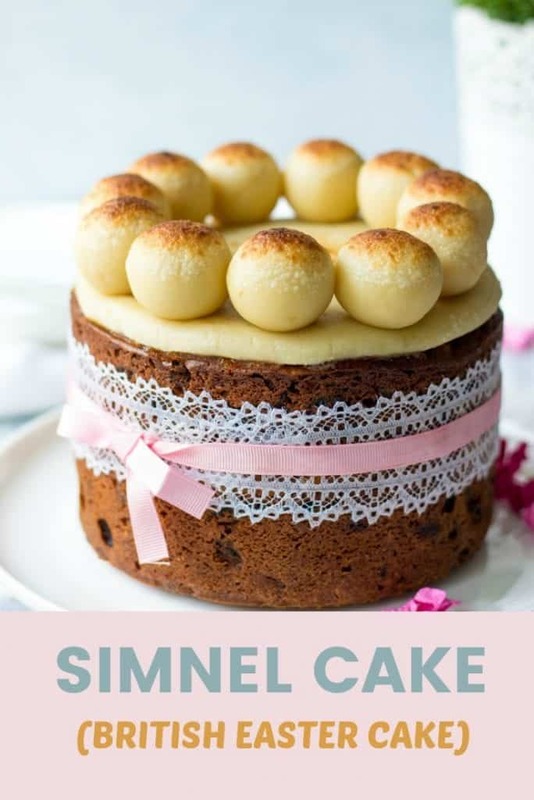 The Simnel cake looks so delicious. I’d love to try it on this weekend. Thanks for your recipe instructions.